Józef Ignacy Kraszewski (28 July 1812 – 19 March 1887) was a Polish writer, publisher, historian, journalist, scholar, painter and author who produced more than 200 novels and 150 novellas, short stories, and art reviews. He is best known for his epic series on the history of Poland, comprising twenty-nine novels in seventy-nine parts. The son of a nobleman, Kraszewski studied at the University of Wilno between 1829 and 1830. He was imprisoned from 1830 to 1832 for participating in a secret patriotic organization. Banished from Congress Poland in 1863, he settled in Dresden, where he remained until 1884. Throughout his life he was active in publishing and journalism. He began publishing in 1830, gradually evolving from a romantic to a realist writer. His literary legacy consists of about 600 volumes of prose, poetry, drama, literary criticism and works on history and philosophy. A major Polish novelist, Kraszewski is known for his cycle of novels on the history of Poland (29 novels in 78 volumes), written between 1876 and 1887, of which the best from an artistic standpoint are The Countess Cosel (1874), Brühl (1875), and An Ancient Tale (1876). Kraszewski's "peasant" novels, including Ulana (1843) and Ostap Bondarczuk (1847), deal with the painful problems of the serf society and community. Outstanding among his social novels on contemporary themes are The Magic Lantern (1843–44) and Morituri (1874–75). The classic Polish realist writers regarded Kraszewski as their forerunner and mentor, however as a novelist writing about the history of Poland, Kraszewski is generally regarded as second only to the Nobel Prize winner Henryk Sienkiewicz. Kraszewski was considered a real cultural institution uplifting the Polish spirit during the country's partition. Kraszewski was born on 28 July 1812 as the oldest son of Jan Kraszewski and Zofia Kraszewska née Malska. He was born to a noble family whose manor was located in Dołhe near the town of Prużany, however, he was born in Warsaw because of his mother who came there in 1812 in fear of the military activities of Napoleon's army heading for Moscow. He spent his childhood in his grandmother's mansion in Romanowo in the Podlasie region, where he would come back eagerly when he was young (nowadays the J. I. Kraszewski Museum is located there). From 1822 he went to schools in Biała Podlaska, Lublin and Świsłocza, and in 1829 he commenced studies in Wilno: first he studied medicine, then – despite his father's disapproval – literature. After the outbreak of the Warsaw Uprising in November 1830, he and a group of his friends were arrested and he was kept in a Russian prison for more than a year, and, once released, he stayed in Wilno under strict police surveillance. When he was finally allowed to come back to Dołhe, Kraszewski continued the literary work he had started in Wilno and completed his education (as the Russian authorities had closed down the local University). The habit of avid but careful reading of literature and reviews from all around Europe would not leave him till his death. In 1838 he married Zofia Woroniczówna, related to the late primate and poet J. P. Woronicz. He did this against the will of his father, who thought his son wanted to reach too high. Once married, the couple settled in Wołyń. In 1853 – already parents to four children – they moved to Żytomierz. From now on Kraszewski concentrated on his literary work, though he did not avoid other activities (he became the superintendent of a high school, the director of a theatre and the Charity Association). As a result of his dispute with conservative public opinion on his critical assessment of the gentry's attitude towards peasants, in 1859 he accepted the proposal of Leopold Kronenberg, a wealthy Polish banker of Polish-Jewish origin from Warsaw, to become the editor of the "Gazeta Warszawska" and he moved with his family to Warsaw. Owing to his editorial skills, the number of the "Gazeta" subscribers within half a year rose from 500 to 8000, but at the same time he had to stand the vicious remarks of anti-Semites. Just before the outbreak of the January Uprising, he was politically active and thus, when the military activities began, he was announced persona non grata in Warsaw by the Petersburg-submissive local authorities and was forced to emigrate, leaving his family in Warsaw. He went to Dresden, where he lived till 1884. In Dresden he became a one-person Polish institution helping the political refugees, and organising literary life and information about Poland. With the death of many great poets of Romanticism, he became the unquestionable literary authority and the favourite of the public. In 1870 as the editor of "Tydzień" he expressed his skepticism about the dogma, approved at the First Vatican Council, that the pope is infallible as far as questions regarding the faith are concerned. That made him unpopular among the national orthodox church authorities, but he did not lose popularity among his readers. In 1879 in Kraków week-long celebrations on the 50th anniversary of the beginning of his literary career were held. In 1883 he was arrested in Berlin and charged with collaboration with French military intelligence, and a year later he was sentenced by the tribunal in Leipzig to three and a half years of imprisonment in a fortress. He served the sentence in the Magdeburg Fortress. As a result of his illness he was temporarily released on bail and went to Italy to improve his health, and after the earthquake there he sought refuge in Geneva in 1886. There, already suffering from cancer, he contracted pneumonia, which was the direct cause of his death on 19 March 1887. His body was brought to Kraków and placed in the vault where the meritorious were buried in the Church of St. Michael the Archangel and St Stanislaus Bishop and Martyr and Pauline Fathers Monastery. 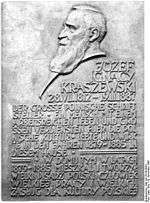 In German and Polish: "Józef Ignacy Kraszewski-in this Dresden building, in 1879–1885, lived and wrote the great Polish writer, a man of great industry and a great contributor to Polish culture." Was one of the most prolific Polish writers of all times. His works comprise more than 220 novels (in the nineteenth century published in about 400 volumes), around 150 novellas, short stories and literary pictures, some 20 theatre plays, more than 20 volumes of historical studies (including the 3-volume Historia Wilna ["History of Vilnius"] and the 3-volume Polska w czasie trzech rozbiorów 1772–1799 ["Poland during the Three Partitions 1772–1799]), a few volumes on his travels, more than 10 volumes of social, political and literary journalism [including 5 volumes of Rachunki (1866–69)], more than 6 volumes of poetry, including a 3-volume epos on the history of Lithuania, more than 20 volumes of his translations from 5 languages (English, French, German, Latin and Italian), several thousand columns, press articles and reviews, which, when printed as books, would have to be collected in more than 100 volumes. He wrote many letters – their number is estimated to reach tens of thousands; just a little part of them have been published so far. He was an editor and a publisher. He prepared for publication and published over 40 volumes of historic documents and works of other writers. 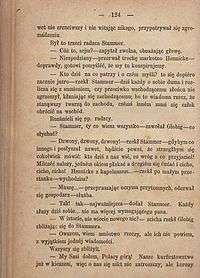 In the years 1841–51 he edited in Wołyń, and published in Wilno the bimonthly "Athenaeum" (66 volumes), in the years 1859–63 after he moved, Kraszewski was the editor of the daily "Gazeta Warszawska" (from 1861 "Gazeta Polska"), and in 1870–71 in Dresden he edited "Tydzień". Despite all that, he was not a man who would be interested just in covering paper with print or writing. He was deeply interested in drawing landscapes and architecture (he illustrated his reports from his travels himself; more than 1600 of his pictures have survived until the present day), took up amateur oil painting, collected old prints (there were more than 6000 works in his collection). Kraszewski loved music. He considered playing the piano for one hour every day to be an extraordinary pleasure for him, and his reviews of concerts or opera performances are characterised by solid professionalism. He travelled widely: he visited the whole of pre-partition Poland and almost the whole of Europe. Throughout his adult life he took an active part in political activities, which resulted in him being sent to prison twice. He participated in dozens of social events, and more than once he had to stand up against public opinion. In his novels he would emphasise loyalty to the real world, thus he would use mimesis, but combined it with his fascination with romanticism. Very well-educated in the field of European literature and aesthetics, he regarded highly not only Balzac, Dickens, Gogol, and later Zola, but also Stendhal, even before he came to be appreciated in his own country, but his heart was always with Adam Mickiewicz. His first works would be influenced by English sentimentalism, especially that of L. Sterne and the French frenetic romantics in the style of the young Victor Hugo or German fantasy in the style of E.T.A. Hoffmann. The group of works closest to the ideals of Romanticism were his novels on the conflict of an artist with reality and on the life of folk people. In some of his works he would concentrate on women's matters (Całe życie biedna 1840, Szalona 1880, Sama jedna 1881), and in dozens – the issues regarding the gentry or the magnates (Latarnia czarnoksięska 1843-4, Interesa familijne 1852, Dwa światy 1854, Morituri 1873). 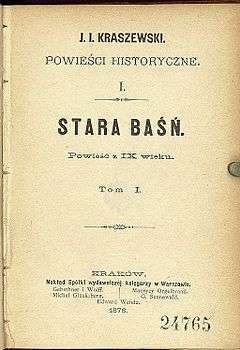 He refers to the 1863 Uprising in a series of political novels written under the name of B. Bolesławita (Dziecię Starego Miasta 1863, Moskal 1865, Żyd 1866 and others). Kraszewski would extend the subject matter of his works, diversify the plot conventions (biography, travel, romance, sensation, etc.) and stylistic forms (realistic way of expression, purpose narration, parable, diary, tale, journal).He also appreciated small literary prose forms, such as, for example, pictures, philosophical sketches and novellas. His works would discuss all the major social and moral issues of his times and would include all the literary motifs favoured by the readers. Until 1863 he would concentrate on topical issues, during his stay in Dresden – on historical ones. Before he left the country he had written 20 historical novels, while in exile – more than 80. Unlike W. Scott he would give priority to the historical truth over fiction, and opted for criticism against the past. In this spirit he wrote Zygmuntowskie czasy (1846) and Diabła (1855), and in Dresden the so-called Saxon series (Hrabina Cosel 1873, Brühl 1874 and others) as well as a group of over 20 other novels on the eighteenth century (including Bezimienna 1869, Sto diabłów 1870 and Bratankowie 1871). He was successful in using tale narration in many of his works. His most famous enterprise within the genre of historical novels, was the series of 29 novels on the history of Poland. He started it with Stara baśń (1876) – which referred to the legendary epoch. From the very beginning the novel enjoyed great popularity, and was later his most often republished work (up to 2000 it was published more than 60 times). Next he wrote about the Piast dynasty (among others Boleszczyce 1877, Król chłopów 1881), the Jagiellonians (Semko 1882, Matka królów 1883 and others) and the oriental rulers (i.e. Boży gniew 1886). The series was completed with the posthumously published Saskie ostatki (1889). Kraszewski's literary activities were characterised by patriotic intentions, tinged with antipathy toward the aristocracy, affinity with the gentry (whose vices he would castigate, but whom he considered to be the mainstay of national awareness) and a tendency to idealise the peasants. The realist writers of Poland's "Positivist" period, notably including Bolesław Prus, regarded him as their teacher. Single-handedly he created a whole library of novels, which in the second half of the 19th century were appreciated not only in Poland—where he was popular even in the twentieth century—but in the majority of European countries. Over a hundred of his novels have been translated into foreign languages. Before Henryk Sienkiewicz, he was the most often translated Polish author. In 2003 the first book in the series, Stara Baśń (An Ancient Tale, 1876), was made into a successful feature film directed by Jerzy Hoffman starring Bohdan Stupka, Michał Żebrowski and Daniel Olbrychski. Wikisource has the text of a 1911 Encyclopædia Britannica article about Józef Ignacy Kraszewski.